A lot has been written and discussed about the exciting developments in font usage on the web - these changes have us all quivvering with joy - envisaging designs which use some of our favourite print fonts. Before you jump straight in and get carried away (which is easily done if you like typography) - let's have a look at a few basics first & then onto a few options for using different fonts for your web designs. There are a plethora of resources, references, articles and websites out there for the enthusiastic typophile. I would encourage you to read up on the various elements of typography and get more familiar with the terminology used as well as the details of type setting. I will not be able to do this subject justice in one article, of course, and will focus on typography for the web alone and some its core principles. typeface? font? ~ what’s the difference? The 2 commonly used terms of “typeface” and “font” seem to be used interchangably these days and though this might not be too important for practical work, especially when designing for the web - it is an intersting aspect to consider and understand. The history of this terminology is interesting, worthwhile exploring further and will hopefully highlight the labour and love that goes not only into the design of a typeface but also the collation of variants into a font file. I will not go into details here but give you a quick definition of the two terms. The typeface is the design, the form. It can have variants, such as bold, italic etc, all of which will keep the form of their original typeface intact, merely becoming a stylistic variation of the original. Designers will consider and decide on typefaces to fit the design and purpose of their project in hand. A typeface is something you see - the actual shape and form of the letters, carefully crafted by a type designer. In contrast, the font is the file which allows the final type to be applied to the design. This used to be the collection of metal fonts for a type variant in the old days of print. Since the arrival of digital media, a font is now the file which you need to have installed in order to use your chosen typeface or type variant. A font is something you use - the format which contains the variant of a typeface. This could be .ttf (TrueType font), or .otf (OpenType font), or any other digital font format. In the early days of the web - the choice of fonts was fairly limited and this state of affairs remained in place until recently. Webdesigners could not approach the typography for their designs the same as a print designer could. The choice of fonts available locally on the work machine was all a print designer needed to worry about. For print design - it is all a matter of purchasing the appropriate license for your desired font or font family, install it on the computer and start working with it immediately. 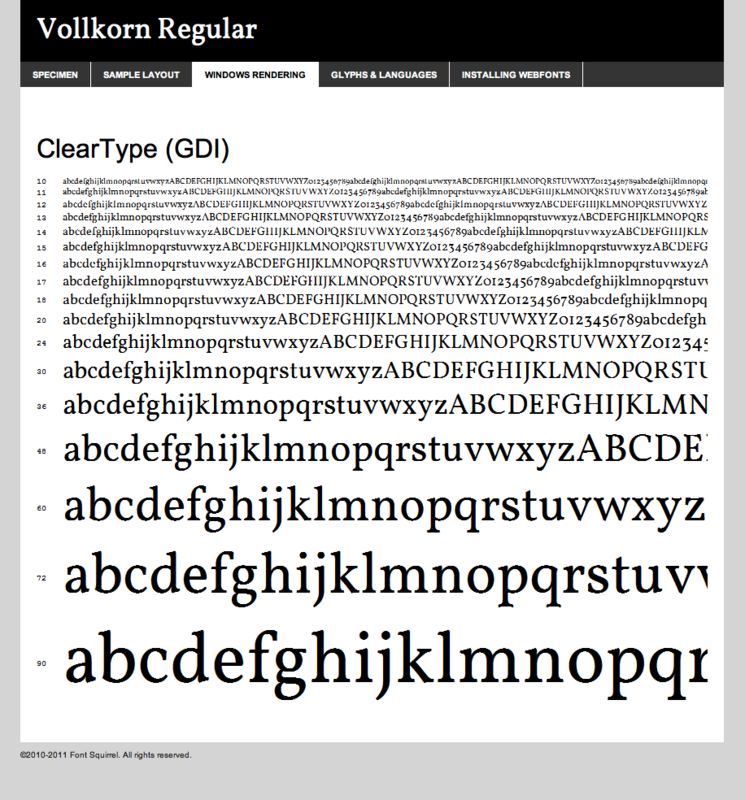 The installed font file will make any type variant available instantly to use within the design. Easy :) It is a whole different game for webdesign, however. Before the evolution of webfonts - the choice of available fonts to use was limited entirely to the commonly installed system fonts, varying on different operating systems. Some print designers moving onto webdesign would struggle with the limitation and find the unpredictable rendering of their carefully crafted, pixel-perfect layouts often frustrating and inhibiting. Though this might have been a hurdle for some - others would argue that this limit of typefaces to choose from for any given website design was liberating, inspiring and pushing skills to the limit. With only a set number of fonts reliably available on end user machines - the designer was required to work within those contraints and push their creativity to still produce a strong and high quality end product. Font stacks became the focus of designers aiming to ensure good typographical display of copy and the task of typesetting had to come with certain downfalls. The choice of an appropriate font stack was vital to produce clearly presented type on the web, considering the spacing and overall layout for all types was essential. The most commonly used trick in the past used to be to simply replace the text with an image containing the same text, presented in its preferred typeface. The typical method is to keep the text in the HTML page and use CSS to display an image as background image via CSS. Typically, the text then gets hidden with a negative text indent, allowing it to be accessible still to search engines and screen readers. The advantage of this technique is that it relies only on CSS and no additional scripts. There are good arguments for simply specifying the font family, rather than listing specific fonts, as this will allow the user settings to take over and give the end user a familiar display, in keeping with their set preferences. However, this will not allow for much precision for spacing and overall layout. This is why font stacks are the best method to control text styling. Choosing the right font stack is the only way to ensure consistent and legible presentation of text elements within any webpage, be that headings, paragraph text, annotations or footnotes. Font stacks go beyond choosing only a specific font family and add more control over the typographical display. There are 5 different font families used for text styling via CSS; the examples shown here are styled by applying the generic font family alone. Though all can be used - I would say that you will mainly use the serif, sans-serif and possibly monospace for your designs. The others are not as common and you are not likely to find many designs which will require these two elaborate typefaces; though they might have a place for styling single words or lines of text occasionally. A font stack consists of a list of fonts, defined in the font-family declaration in CSS. 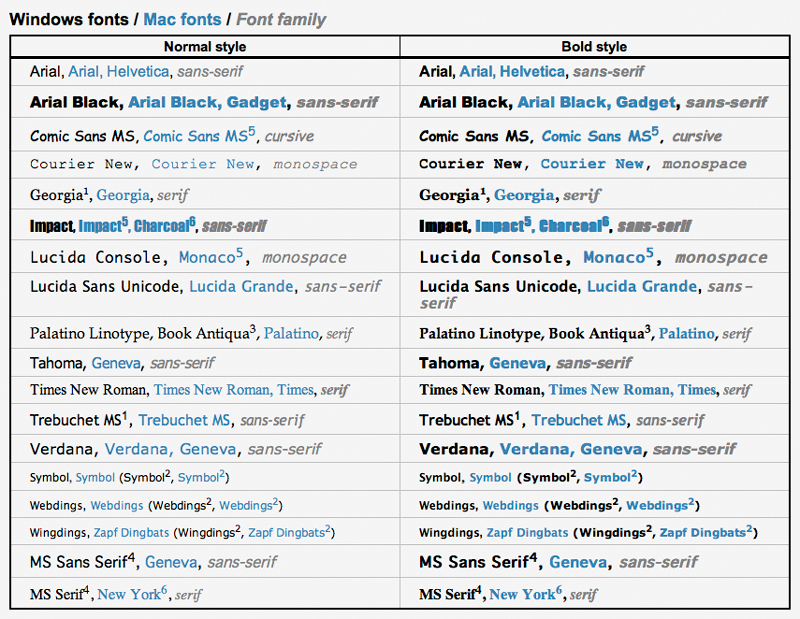 Listed in order of preference, the fonts are used when available via the end user’s computer. These font stacks are typical for their reliance on core system fonts alone and there is no reason why you cannot produce an impressive design with these fonts alone. However, looking further into the newer system fonts now found on newer operating systems will allow you more choice and finer selection. When designing a page for the web - you will not only need to find the one typeface which you would like to use but expand your search into possible alternatives which can be substituted for your first choice. Luckily there are various resources out there for you to check on availability of fonts installed on different system and even via specific apps. 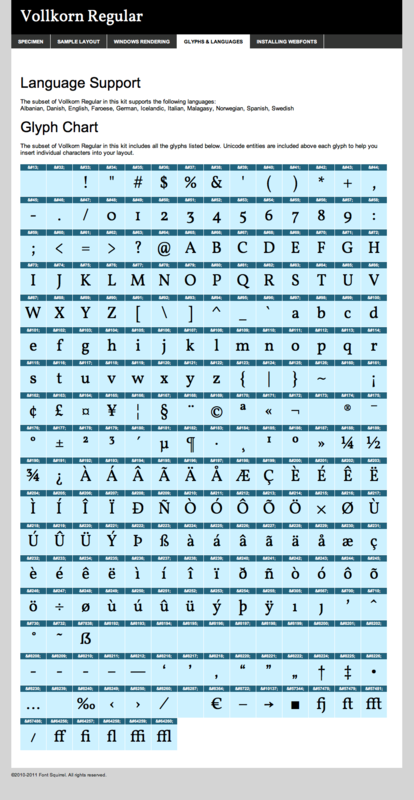 One of the best I have found is the font matrix by Richard Rutter. your preferred font If the name of the font family is more than one word, you will need to add quotation marks around the full name. one or more possible substitutions You can add several alternatives, as many as you think you might need, though you don’t need to many in most cases. font family Lastly, always include the correct font family. This will ensure a safe fallback should all other fonts be missing. Take care to select fonts which are ‘comfortable’ with each other, which are similar in x-height, character width as well as weight and you will ensure your nicely crafted layout will not be compromised if your preferred font is not found. This is not quite as easy as it might sound. 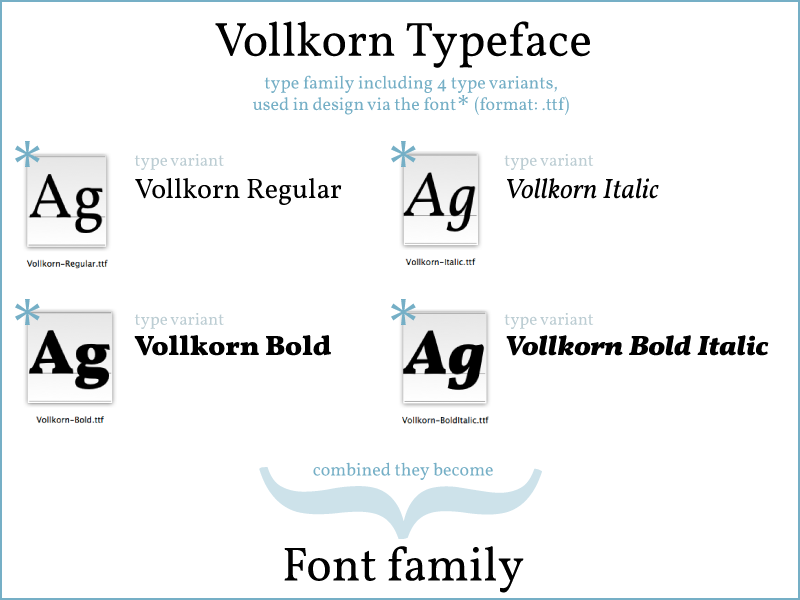 Typefaces of the same generic font family do vary, sometimes quite substantially, in proportion and weight. Imagine a fixed layout and your plans for headings, for example. You might aim for a certain width, at an estimated number of characters per line. If your font stack is well thought through - your design and layout should hold throughout changes of actual font used. In case you did not plan ahead and chose fonts varying too much - you might see some misbalanced elements within your layout. Take a look at the example below, showing text in a graphics application (Illustrator). Though this is not a true representation of how a browser would render the font - it does show the difference between these sans-serif typefaces quite clearly. Though you should always use a good font stack to control the typography of your web designs - you can also use webfonts which are font files embedded in your website using the @font-face rule. The font stack will include your chosen webfont in its first instance, the rest of the fonts listed will then act as a fallback in case your chosen embedded fonts should fail. The technique of webfonts via the @font-face rule has been around for a number of years already, initially used in Netscape Navigator but then discontinued. Microsoft developed its own font format for use with the @font-face called ‘Embedded OpenType’ format (.eot) which has been in use since IE4. Though this was a great move towards more choices for webdesign - it remained a somewhat closed area due to IE’s reliance on its own font format. Soon other browsers followed suit and started to support the @font-face rule - however, the font formats supported were not the .eot but the more commonly used formats, such as TrueType (.ttf) and OpenType (.otf) and others. Now, Safari, Firefox, Opera and Chrome all support the @font-face rule. This early font format by Microsoft is proprietary and exclusively supported by Internet Explorer. EOT fonts are required for all versions of IE, especially for all earlier versions. Only IE9 includes support for the WOFF format as well. Developed by Apple as a competitor to Adobe’s Type 1 format, used in PostScript. TTF fonts were soon widely adopted as the most common format for system fonts and are now compatible with most operating systems. The OTF format was developed by Microsoft and Adobe and is based on the TrueType format. It does include typographical features such as ligatures though these are not yet fully supported by all browsers. The WOFF format is currently in the process of being standardized and the W3C who published a working draft in July 2010 is expecting it to become the interoperable format which all browsers will use in future. It is important to note that WOFF is not actually a font format per se - but rather a wrapper containing fonts such as TTF and OTF. SVG fonts are different to other font formats as they contain the letter outlines as vector objects. SVG fonts are usually quite heavy in file size as they do not have the compression built in as other formats do. The most common use of this format remains either the iPhone and iPad, prior to iOS4.2, or their implementation via web font providers (as covered in more detail later). Before you go ahead and use any of your favourite fonts - you will need to make sure to check the End User Licensing Agreement (EULA). If your license is specifically for embedding or includes the permission to do so - you are safe to use the font via @font-face. If you are not sure what your license permits - it will be best to check with the font vendor and ask before using the typeface for your design. In order to use the @font-face rule - you will need to ensure that the font file, in its appropriate format, is hosted in the site’s directory on the server (local or remote) . 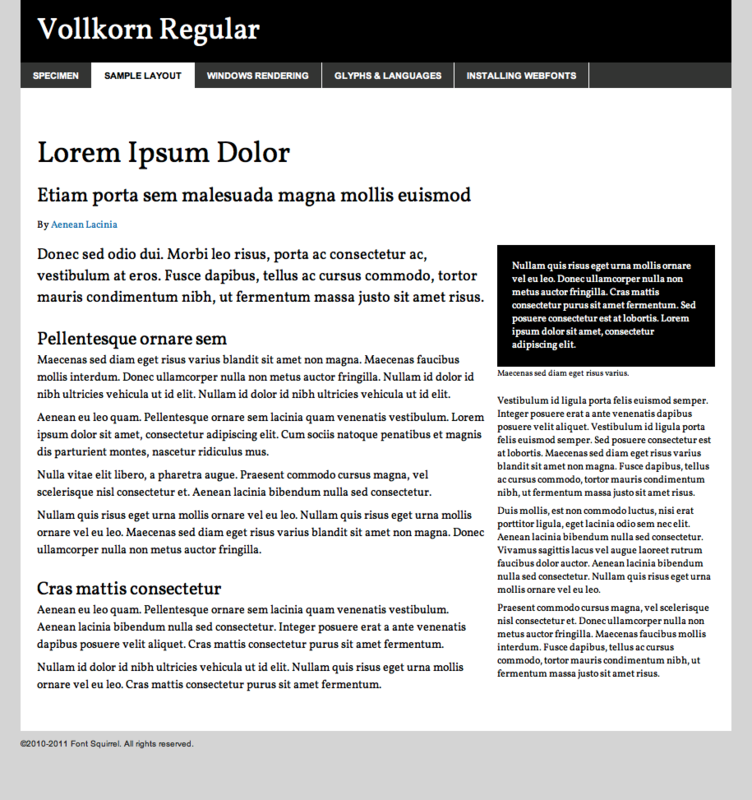 It will then be loaded via CSS, enabling the browser to render the copy in your chosen typeface. The @font-face rule works by allowing you to link to a font file in your style sheet. It is the same principle as linking to images, for example. 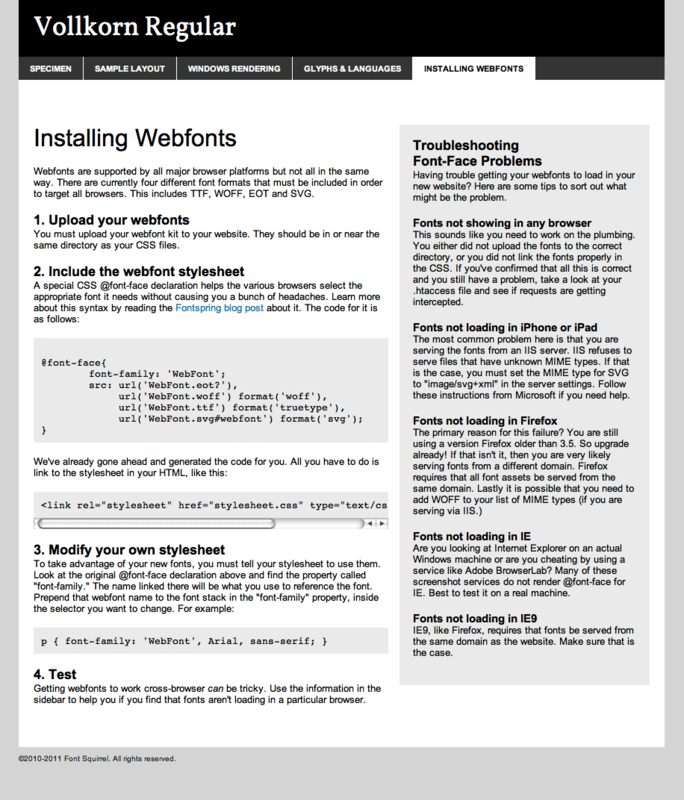 There are various online tools available to use for font conversions. Some allow you to convert to specific formats only, others are available as downloadable app. For example, the ‘eotfast’ app is a PC only program which converts .ttf fonts to .eot. By far the best tool I have come across and which I would highly recommend is the @font-face generator by FontSquirrel. The site is one of the best resources for both free and commercial fonts. Licenses on offer cover the embedding specifically and as part of the resources - you can use the generator to convert your font files to different formats. The @font-face generator is fantastic and gives you different tool options, after processing your font - you will be able to download a folder of resources: The presentation of these resources is nicely compiled into a demo HTML page, allowing you to view the font at different sizes, in a sample layout and preview the rendering on windows. There is also a section on glyphs and languages as well as instructions on how to use the fonts. TypeIt, type accent marks, diacritics and other characters, Tomasz P. Szynalski.